So I went veryyyyy clean and simple with this design. I began by die cutting two deer, one from white cardstock and one from True Black cardstock – I wanted a very stark difference. Next I stamped the “believe” all over the white deer in black ink. Once dry I adhered them together offset and used dimensional adhesive to place him on the white card base. And of course a little red bead on the nose for some added whimsy and a mini color pop. 🙂 I’m obsessed. To show off the gorgeousness (totally a word!) of the intricate snowflakes in the latest Mix & Mat dies, I die cut them from the birch pattern paper from the Wonderland kit and layered it on top of a panel of Smokey Shadow cardstock. Thank you all so much for stopping by my blog! Don’t forget to check out all of the other creations from the design team on Nichole’s Blog and I will see you all tomorrow! Much love friends! 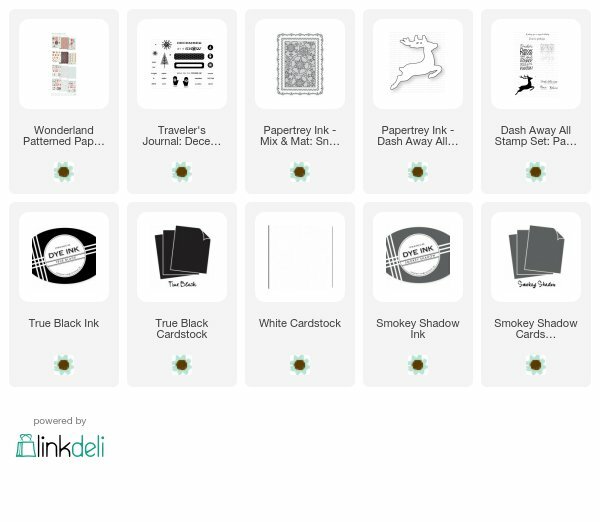 Indeed Stephanie I am really appreciating all your clean and simple cards….love the dash away all card….simply stunning in its simplicity….keep them coming!! I have loved EVERY STINKIN’ CARD you’ve made for this release. Every one of them. Every. Gah, you’re killing me! Love the way you did the deer! Great idea! Your simple elegance on the deer card and your rustic elegant take on the snowflake card are both so eye catching and drool worthy in my book! These two cards are gorgeous, but the little red nose on the reindeer has my heart !